State Senator Dan Claitor (R–District 16) is leading an effort in Louisiana to repeal various outdated laws on its books. In a recent report on these efforts, there’s an interesting comment from radical cleric Gene Mills. In both the online and print editions of the Baton Rouge Advocate, Mills—head of the state affiliate of Focus on the Family—was asked about Claitor’s bill repeal a 1981 law requiring “balanced treatment” for evolution and creationism. The 1981 law was struck down by the US Supreme Court in 1987’s Edwards v. Aguillard decision, but it was never taken off Louisiana’s books. Gene Mills, president of the Louisiana Family Forum, said he’s unsure if he will oppose Claitor’s bill this year. He said discussing creationism in the classroom is protected by the Louisiana Science Education Act, a law passed in 2008 that allows teachers to supplement their science instruction with theories that are critical of evolution and global warming. Now, since the misnamed LSEA was proposed, its advocates have claimed that there was nothing creationist about it, but here Mills seemed to be giving away that game, agreeing that the bill really does protect creationist lessons. Editor’s note: this story has been changed from the original version to reflect that the Louisiana Science Education Act does not expressly protect the discussion of Creationism in the classroom. Instead, it protects the discussion of strengths and weaknesses of any given scientific theory, by allowing teachers to supplement science instruction with theories critical of topics like evolution and global warming. The editor’s note looks for all the world like a direct quote from an email, either from Mills or even the Disco. ‘tute. To be fair, it isn’t clear whether the revision happened because Mills didn’t actually say “creationism,” or if he just bullied the paper into toning down the story. Either way, what Mills said undercuts the rhetoric of the law’s defenders, and demonstrates the point critics have been making. 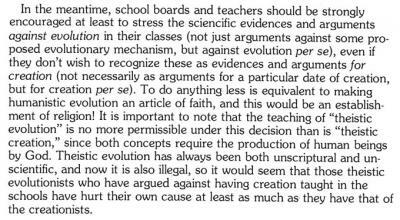 Mills appears to feel that the LSEA covers comparable ground to the 1981 law, that “the discussion of strengths and weaknesses” of evolution is the rough equivalent of requiring equal time for creationism. From Wendell Bird (1987) &quot;The Supreme Court Decision and Its Meaning,&quot; ICR Impact #170. school boards and teachers should be strongly encouraged at least to stress the sciencific [sic] evidences and arguments against evolution in their classes (not just arguments against some proposed evolutionary mechanism, but for creation per se), even if they don’t wish to recognize these as evidence and arguments for creation (not necessarily as arguments for a particular date of creation but for creation per se). Mills’s comments on repeal of the 1981 law seem to repeat this line of argument, implying that arguments against evolution are de facto arguments for creationism. The anti-evolution lessons the law explicitly protects will have the same effect as the creationist lessons from the 1981 law. And until the legislature acts to repeat the LSEA, the 1981 “balanced treatment” law is far from dead letter. What’s the Future of Texas Textbook Battles? Don’t Let Heartland Fool Teachers!